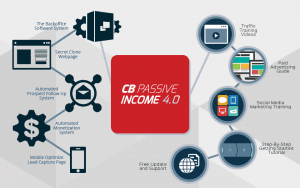 What is CB Passive Income? What will it do to you? Is this something for you? Or is this a scam? Read more here to receive the answer. In CB Passive Income 4.0, from now on just CB Passive income, you will receive a free hosted landing page template that is made to convert visitors to your email list. You will also receive promotional material that you can use to promote your landing page. CB Passive Income will then send done for you promotional emails to your subscribers that join the email list​. You will also receive training in how to promote your landing page and how to use their software. So this is a low level done for you affiliate marketing program where you only need to send converting traffic to your landing page. The price is $47 each month or $97 for lifetime access. I recommend the lifetime access. Affiliate marketing can be hard and costly to start with if you do everything yourself. Here is much of the work done for you. Computer skills are not needed. When you have gained enough experience in this program, you can easily expand your business and scale your online business further. Your subscribers will not be accessible for you before you pay for a upsell they have. Some struggle to receive traffic, even after a course. The Digital Cover Creator: A Software with highly advanced functions to make professional 3D book e-covers without designing skill. The Email Assassin Home Course: Advanced email marketing tactics. The CB Passive Income Accelerator Training: How to get started with Clickbank. 6 Months of Insider Training & Tools Membership: Free access to this the first 6 months! I recommend you to choose the lifetime access. All you do is to drive traffic to the landing page given to you. Now the traffic is a hard part, but you will receive training. This system is a very beginner friendly and is excellent to start this program early in your online career. Later you can evolve your business and make your own landing page with your own email marketing. This way you can promote more products and choose the products yourself. The number one issue beginners have is everything they need to learn. All the information and things they need to do will just be to much. Here is a big part of the business provided by others and makes the first big step easy to do. What is the first big step? To know how to begin your path to online income! Everything seems to hard to begin with and here is a course with software that does half of the job. CB Passive Income makes the path more comfortable for you.